Print this page out and hang it in your office/cube. You’re welcome. Keyboard shortcuts are combinations of two or more keys that, when pressed, can be used to do a task that would typically need a mouse or other pointing device. The keyboard shortcuts described here refer to the United States keyboard layout. Keys on other layouts might not correspond exactly to the keys on a U.S. keyboard. 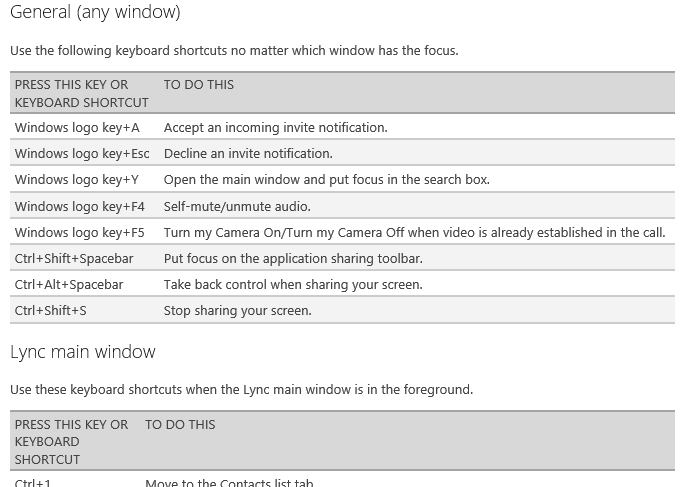 These Lync keyboard shortcuts relate to the feature areas of the Lync user interface (UI). So, for example, you’ve have to be in a contact card for the Esc key to close the contact card. Tab and Shift+Tab are common ways of moving through any UI. Tab moves through the UI in order, whereas Shift+Tab moves through it in reverse order. Some features might not be available for your account. We’ve indicated these.